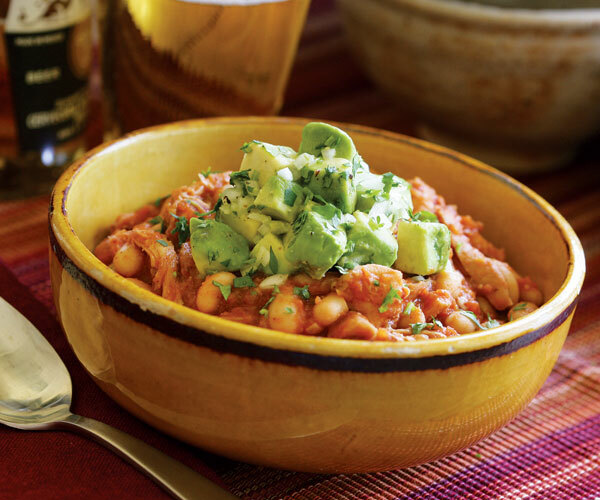 Puréeing some of the beans along with the canned tomatoes in this recipe gives the dish a thick texture and a rich, slow-cooked feel. Chipotle chiles are available canned with adobo sauce in many supermarkets and specialty food markets. Juice of 2 limes, about 6 Tbs. Toss the avocado, about one-quarter of the onion, 2-1/2 Tbs. of the lime juice, and 2 Tbs. of the cilantro in a medium bowl. Season with salt and pepper to taste and set aside. In a food processor, combine 1 cup of the beans, the tomatoes and their juice, the chipotles, and adobo sauce and process until smooth. Set aside. Season the chicken with 1 tsp. salt and 1/2 tsp. pepper. Heat the oil in a large Dutch oven or casserole over medium-high heat until it’s shimmering hot. Add the chicken (the thighs should just fit, evenly spaced) and sear without touching until golden brown, 3 to 4 minutes. Flip and cook the other side until also golden brown, 3 to 4 minutes. Transfer to a large plate and let rest for 10 minutes. Take the pot off the heat and set aside. When the chicken has rested, shred it by hand or chop it coarsely. Return the pot to medium-high heat. Add the remaining onion to the pot and cook, stirring, until the onion begins to brown and soften, about 3 minutes. Add the chili powder and cumin and stir for 20 seconds. Add the beer and cook, scraping the bottom of the pan with a wooden spoon to incorporate any browned bits, until it almost completely reduces, 3 to 4 minutes. Add the remaining white beans and the puréed bean mixture and bring to a boil. Stir in the chicken along with any accumulated juices on the bottom of the plate. Cover, reduce the heat to medium-low and simmer for 15 minutes so the chicken finishes cooking and the flavors mix and meld. Stir in 1-1/4 cup of the cilantro and the remaining lime juice and season with salt and pepper to taste. Ladle into large bowls and serve immediately with a generous spoonful of the avocado mixture, a dollop of sour cream (if using), and a sprinkling of the remaining cilantro. Serve with Mexican rice or cornbread. Homerun with the family. I’ve made this recipe 4 times - once as a tester (I try it before introducing it to family), twice for home, and last time for a family camping trip with friends. Yes, it is ABSOLUTELY TOO SPICY if you use the recommended adobo sauce (we tend towards flavorful- not burning tongue- hot). After adding in one-quarter of the adobo sauce and seasoning to taste, the entire family LOVES this chili. It is true that leftovers are rare, so I double the recipe. The chili is even better the following day as the spices meld into the purée. The heat also kicks up a notch, which is why I add in one-quarter of the adobo sauce, in anticipation of this afterburner release in the chili. This was amazing and is a new staple, it would be just as yummy with a rotisserie chicken, I think the chicken thigh was a messy, time consuming addition that doesn't enhance it anymore than rotisserie chicken would. LOVE this though. Excellent. The avocado topping made this meal.